a condition due to ingestion of excessive amounts of fluorine or its compounds; see fluoride poisoning. 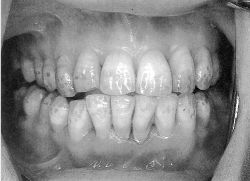 chronic endemic fluorosis that due to unusually high concentrations of fluoride, usually in the natural drinking water supply, typically causing dental fluorosis characterized by a mottled appearance of the teeth. Combined osteosclerosis and osteomalacia can also occur in occupational exposures to vapors and dust. dental fluorosis hypoplasia of the dental enamel resulting from prolonged ingestion of drinking water containing high levels of fluoride, manifested by the condition called mottled enamel. skeletal fluorosis skeletal changes due to long term ingestion of excessive fluoride; they may include hyperostosis, osteopetrosis, and osteoporosis. 1. A condition caused by an excessive intake of fluorides (2 or more ppm in drinking water), characterized mainly by mottling, staining, or hypoplasia of the enamel of the teeth, although the skeletal bones are also affected. 2. Chronic poisoning of livestock with fluorides that blacken and soften developing teeth and reduce bones to a chalky brittleness; most often caused by ingestion of forage contaminants near large aluminum plants. 1. a condition due to ingestion of excessive amounts of fluorine. 2. a condition in humans due to exposure to excessive amounts of fluorine or its compounds, resulting from accidental ingestion of certain insecticides and rodenticides, chronic inhalation of industrial dusts or gases, or prolonged ingestion of water containing large amounts of fluorides; characterized by skeletal changes such as osteofluorosis and by mottled enamel when exposure occurs during enamel formation. 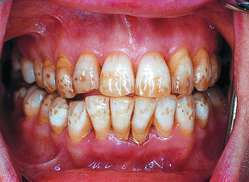 An abnormal condition caused by excessive intake of fluorine, as from fluoridated drinking water, characterized chiefly by mottling of the teeth. the condition that results from excessive prolonged ingestion of fluorine. Unusually high concentration of fluorine in the drinking water typically causes mottled discoloration and pitting of the enamel of the secondary and primary dentition in children whose teeth developed while maternal intake of fluorinated water was high. Severe chronic fluorine poisoning leads to osteosclerosis and other pathological bone and joint changes in adults. See also fluoridation, fluoride. Chronic fluoride poisoning Toxicology A chronic low-level intoxication that occurs where drinking water has fluoride > 2 ppm Clinical Weight loss, brittle bones, anemia, weakness, ill health, stiffness of joints, mottled enamel and chalky white discolored teeth with a normal resistance to caries; fluorosis is common, given flouride's availability in mouth rinses, toothpastes, misuse of fluoride treatments. See Fluoride, Fluoride poisoning, Fluoride treatment, Fluorine. A condition caused by an excessive intake of fluorides, characterized mainly by mottling, staining, or hypoplasia of the enamel of the teeth. Poisoning with repeated large doses of the element fluorine. This may affect aluminium ore (bauxite) miners and workers involved in insecticide and phosphate fertilizer manufacture. The calcium in the bones is gradually replaced by fluorine and the bones become soft and crumbly. Abnormal bone protrusions occur and these may cause trouble, especially in the spine, where they may press on the spinal cord or nerve roots. n problem caused by excessive or protracted ingestion of fluorine. Causes a mottled appearance of the teeth and in extreme cases, pitting in the deciduous and secondary teeth. May be present in the offspring of females whose fluoride intake was high during pregnancy. 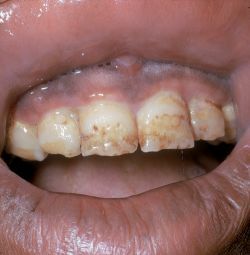 Condition caused by an excessive fluoride intake (2 or more ppm in drinking water), characterized by mottling, staining, or hypoplasia of the tooth enamel. n an enamel hypoplasia caused by the ingestion of excess fluoride during the time of enamel formation. General term for chronic fluoride poisoning. n an enamel defect caused by excessive ingestion of fluoride, possibly in the water supply (usually 2 to 8 ppm) during the period of tooth calcification. Affected teeth appear chalky white on eruption and later turn brown. n an abnormal condition resulting from the ingestion of too much fluoride, causing a white or brown mottled appearance to the enamel of developing teeth. n a classification system for determining the presence and severity of chronic fluoride poisoning in which the enamel on individual teeth is rated against a 0 to 4 scale with 0 representing normal enamel and 4 severely damaged enamel. This index may be used by communities to adjust the levels of fluoride in their water systems. a condition due to ingestion of excessive amounts of fluorine or its compounds. Fluorine poisoning usually takes a chronic form in animals which are exposed to small amounts in their drinking water or food over long periods. Clinical signs include excessive wear and mottling of developing teeth, lameness due to osteoporosis and unthriftiness. Acute fluorosis caused by factory effluent is characterized by gastroenteritis, tetany and death. Furthermore, a high amount of fluoride in drinking water is a cause of concern as it may lead to dental fluorosis. In India, few researches have been carried out in fluorosis affected areas to see the gravity of the problem and reason behind it. The present hospital-based study was conducted to correlate the occurrence of dental fluorosis in children aged 6-14 years belonging to Avarankattur Village with that of fluoride content of drinking water from various sources and other related factors by convenient sampling technique since the duration of the study was 3 months. De la mano de la evidencia sobre los mecanismos normales de formacion del esmalte (resumida anteriormente), se han desarrollado estudios de induccion de fluorosis para comprender que etapas del proceso se ven afectadas por el fluoruro, como se describira a continuacion. Se consideraron los datos epidemiologicos relacionados a la presencia y/o ausencia de la fluorosis dental. While the best etching result were obtained at 30 s for the moderate fluorosed enamel, increased etching time for severe fluorosis result in less retentive surface The bond strength of all the adhesive systems to enamel is adversely affected by flurosis. Too much fluoride will cause gastrointestinal pain, nausea, headaches and dental fluorosis,' said Abellera. Brushing your kids' teeth: To fluoride or not to fluoride? Oxidative stress induced by fluoride played an important role in the pathogenesis of fluorosis that may result in tissue damage and other secondary complications. Dental fluorosis in children from Princesa Isabel, Paraiba. Among 23 developed and developing nations that are endemic to fluorosis Ethiopia is of particular interest due to the predominance of extensive volcanic basalt flows , low socio-economic level, recurring famine and malnutrition which might exacerbate the problem. Oral Health status assessment included the presence of dental decay, periodontal diseases, oral hygiene status, malocclusion and fluorosis. El recorrido en el tiempo sobre el estado de conocimiento que se tiene sobre la fluorosis es uno de los objetivos que se proponen en este manuscrito, pero sin lugar a dudas el objetivo primordial es la toma de conciencia y de responsabilidad que significan los tratamientos preventivos que involucran alimentos y materiales dentales fluorados.